Want more? Check out Sue's first book Fade to Black! Visit the following Blogs on the Masks and Mirrors Virtual Tour! Review from WorkadayReads, who called the book "intriguing and interesting!" Review of Masks and Mirrors from Cassandra G., who says "you won't be disappointed!" Guest Post Feature at What is that Book About? Review of Fade to Black at Every Free Chance Reviews, who says, "You may find yourself NEEDING to read the next book right away! It took me quite a bit of discipline (and sleep deprivation) to go to bed instead of staying up all night to start the second book." Review of Masks & Mirrors at Therian, who says, "Another stunning read by Sue Duff, this book was as magical and exciting as the first. I was once again sucked into the world of the Weir as the fight between good and evil only intensified." Excerpt Feature of Masks & Mirrors at Bibliophilia, Please! Review of Masks and Mirrors at Every Free Chance Reviews, who says, "I am Love LOVE LOVING the Weir lore and background. 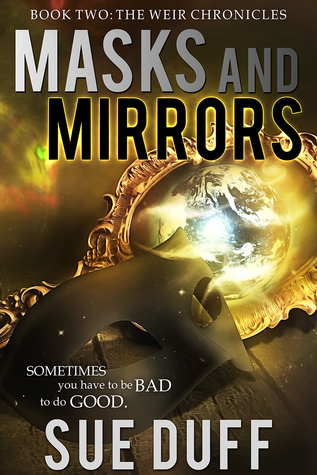 The characters in Masks and Mirrors are solid and well thought out, and the plot is complex enough to keep you interested, but not so convoluted that you can't figure it out. I find it skillful!"